What is a Bitcoin Improvement Proposal (BIP)? 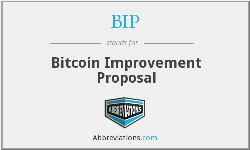 A Bitcoin Improvement Proposal (BIP) is a proposal that is made by a person to improve the general Bitcoin ecosystem. This can include many different aspects of Bitcoin. Generally, BIPs are made by developers or other people who possess advanced computing skill and knowledge. The reason why BIPs are generally made by people with advanced computing knowledge is because they tend to be highly technical and are often beyond the understanding of ordinary people who do not possess this specialized education. Usually, BIPs are made when a person believes that he or she may have identified a new idea that could make Bitcoin more effective. The very first BIP was put forth by a man named Amir Taaki. This BIP was labeled BIP 0001 and was published on August 19th, 2011. Essentially, BIP 0001 was just an explanation of how the BIP process would work, and what the standards would be. Ever since the first BIP was made, many others have come. However, despite the fact that many BIPs are frequently put forth, they are generally divided into three categories. These three categories are: Standards Track, Information, and Process. Here is a closer look at each of these three BIP types. Standards Track BIPs are BIPs that are geared towards Bitcoin network protocol, blocks, or transaction validation. So, these types of BIPs really get at the heart of Bitcoin and its underlying technology. Because of this, any Standards BIPs that are accepted by a consensus of Bitcoin developers and the Bitcoin community can have a major impact on the cryptocurrency. However, because Bitcoin is already so solid and popular, it can be extremely difficult to have a Standards Track BIP approved and put into effect. Information BIPs are primarily centered around issues such as design and general guidelines. In other words, they are not proposals for things such as scaling solutions, changes to blocks, or changes to hashing protocols. Although these BIPs may not be as significant to the underlying structure of the Bitcoin protocol they are still relevant, and can be important. Given that Bitcoin is not run by any particular company, any proposals that can help to improve the community or guidelines already in place can be very helpful. As the title indicates, Process BIPs are proposed changes to the Bitcoin process. In this way, these types of BIPs are very similar to Standards Track BIPs. However, there is one key difference; Process BIPs only apply outside of the Bitcoin protocol. So, Process BIPs only apply to things that are related to Bitcoin, but which are not directly involved in the technology and coding that deals with the actual structure of the cryptocurrency. Again, while these BIPs may not be as integral to the central concept of Bitcoin, they are still extremely important. This is the very first section of the BIP. In this section, the author should include details such as the BIP number, a short title for the BIP, BIP meta data, and the contact number and name of the author or authors. Providing this information allows the BIP to be well organized and makes it more easy for it to be shared and searched for. If this information was not provided in the preamble, then it would be very difficult to keep BIPs organized. The abstract is a description of the BIP that is supposed to be 200 words or less. This component of a BIP makes them somewhat similar to research papers, which also have abstracts. If you are planning on submitting a BIP, then this is where you should lay out the essence of your proposal in the simplest and shortest terms. People should be able to look at your abstract and quickly be able to understand what your BIP is about, and what the central point of it is. In this section, you should indicate any relevant copyright information for your BIP. This can include public domain or open publication licenses, etc. If you are using information that is licensed, you must site it here to make sure that all legal parameters are being followed. This also lets the reader know what sort of copyrighted information might be involved with your BIP. Sometimes, this can impact the utilization of an idea. The specification area provides the details of any new features or concepts that you are introducing. Considering that many BIPs introduce new concepts, this area is generally extremely important for many BIPs. It is in this section where readers will be able to have their questions answered about how your idea works, and how the new features you are proposing will function. This section provides a lot of the meat for the overall BIP. For this reason, you need to make sure that you write this section very clearly. If your specification area is not well written, then your BIP may not be taken as seriously as it would otherwise. This is the area where you will be able to describe exactly why your idea is an improvement to the Bitcoin protocol, community, or design. You will be able to discuss why the current solution that is in place is simply not good enough, and why your idea is better. Of course, there is no guarantee that a majority of other Bitcoin developers will agree with you. However, this is the area where you get to make your argument, for better or worse. Before you even think about creating your BIP, you should first make sure that your idea has a valid justification that you can articulate in this section. If not, then your BIP probably will not get very far. The rationale section is somewhat similar to the motivation section. However, in the rationale section, instead of discussing why the idea is needed, you will discuss why you made the decisions that you made in the crafting of your BIP. This could include decisions you made about design features, strategies you used to overcome perceived objections to your idea, etc. This is your chance to answer your critics before they even have a chance to criticize your work. Use this section wisely if you are going to submit a BIP. In this section, the author will inform readers whether or not his or her Bitcoin Improvement Protocol is backwards compatible. If it is not backwards compatible, then the author will explain the details of the incompatibilities. He or she should also explain how severe they are if there are incompatibilities. In this area, the author should also explain his or her plan to deal with these incompatibilities. This is a requirement because if there is no plan, then it could potentially lead to problems. In the reference implementation, the author of the BIP is expected to provide an example of his or her idea that can be referenced by other developers who may try to implement it down the line. Essentially, this is the area of the BIP where you demonstrate your idea, and present it to the community. If you do not have a completed example of your idea, then this can be a major weakness for your BIP. After all, people want to see what the idea actually would look like, not have to imagine it for themselves. So, it may be worth your while to finish your reference implementation before your submit your BIP. As the Bitcoin prices continues to rise (currently about $10,000), BIPs have higher and higher stakes. This is because increasing amounts of wealth are being tied to Bitcoin. This means that positive changes that go through could potentially make Bitcoin even stronger. However, if any negative changes are implemented in the Bitcoin protocol, then it could have an undesirable effect on the cryptocurrency. Bitcoin was the first cryptocurrency to ever be invented and thus won over a lot of the market share in the early days. In fact, Bitcoin currently claims roughly 53 percent of the total cryptocurrency market cap, which is roughly $300 billion. However, there are now 16 cryptocurrencies with market caps over $1 billion, meaning that Bitcoin does have some competition. So, if BIPs are approved by the Bitcoin community that do not actually help the cryptocurrency, then Bitcoin could risk losing market share to competitors such as Ethereum, Litecoin, or others. Much of the debate, and the BIPs in recent years have been about how to effectively scale Bitcoin. A number of solutions have been put forth to attempt to scale Bitcoin effectively. There have even been a number of hard forks in the currency, including Bitcoin Cash, and Bitcoin Gold. Both Bitcoin Cash and Bitcoin Gold are offshoots of the currency with slightly different properties of the original Bitcoin. For example, Bitcoin Cash has larger block sizes, which are intended to make scaling easier. Other solutions have been put forth such as SegWit2x and The Lightning Network in order to help the Bitcoin scaling issue. The official launch of Segwit2x was cancelled as too few members of the Bitcoin community approved it. However, the Lightning Network moved forward, and could prove to be instrumental in solving the Bitcoin scaling issue. Hopefully, one day, the Bitcoin protocol will be completely perfect, and no new ideas will be required to be put forth to improve it. However, until then BIPs will most likely continue to be postulated by developers and other people. After reading this article, you should have a much better understanding of what BIPs are, what their structure is, and a broader perspective of how they are being used in the community. If you have a great idea for a BIP, then feel free to create one using the above structure and submit it. Who knows, maybe your idea will be the next big Bitcoin breakthrough.